After December 7, 1941, and entry of the United States into World War II, all civilian flights were forbidden within 150 miles of the California coast. As a result, all pilot training and civilian aviation was either discontinued or was required to move their operations to a desert location. 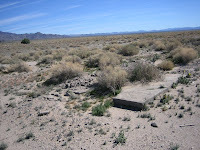 Silver Lake, a playa (dry lake bed) located in the Mojave Desert, became home for civilian students enrolled in the Chaffey College pilot training program. Because of its smooth flat topography and hard surface this waterless basin proved ready-made for the take-off and landing of aircraft. In the spring of ’43, the CPT program changed to War Training Service and the Army Air Force assumed all flight-training with the college still providing ground-school instruction. Trainees arrived from all over the west including both army and navy cadets. . The agreement between the Army and the college was concluded on February 1, 1944, ending all training activities at Silver Lake. Over 500 students completed the program at the desert campus and went on to serve in various branches of the military. The aircraft and buildings were auctioned off and the money was used to further the aeronautical training program on the Ontario campus. The physical plant included two barracks for the trainees and one for the instructors; a small office; a building that housed classrooms, a dining room and kitchen; a utility building; and a restroom and shower building. A total of 23 aircraft toed-the-line including: Cubs, Wacos, Travelairs and Fleets purchased from around southern California and repaired and outfitted for training by Chaffey students enrolled in the college’s air maintenance program located in Ontario. For the first six months, trainees lived in tents. 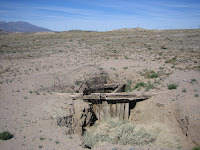 The campus is located eight miles north of Baker on Highway 127 adjacent to the abandoned railroad town of “Silver Lake” (1906 – 1930). By lining up the mountains in the background of the photograph “Parade Rest” you’ll be able to locate the pipe where the flag pole stood and from that point you can determine where the buildings were located using the layout sketch above. You can find a number of concrete foundations of the main buildings. And as you walk towards the highway you’ll find the water well and trash dump. A campus newspaper article mentions an auxiliary field used to train students during the first three months of operation. At that time, only six plans were available. The article states that the field was located 10 miles north of Silver Lake and was called Gregory Lake. The site had temporary living facilities including barracks, classrooms, dining room and kitchen. 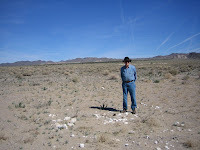 Actually, they were using Silurian Dry Lake as the auxiliary field located ten miles north of Silver Lake on the east side of Highway 127. Nothing remains on the ground to indicate where the facilities were located (that I could find). Pasadena City College’s training campus operated out of the Silver Lake Airfield located about 5 miles north of Baker. Established by the Department of Commerce in the ‘30s it provided intermediate service to pilots flying the Los Angeles-Salt Lake Airway corridor. It had a beacon with rotating 24 inch light to direct those risky night flights across the desert.